We take a look at some of the very best filmmaking drones and accessories out there right now. If you are interested in filmmaking, you are probably intrigued by the possibilities of using drones in your work. But what is the best drone to choose? And what accessories will you need? Expensive crane shots are now being replaced by the use of drones. 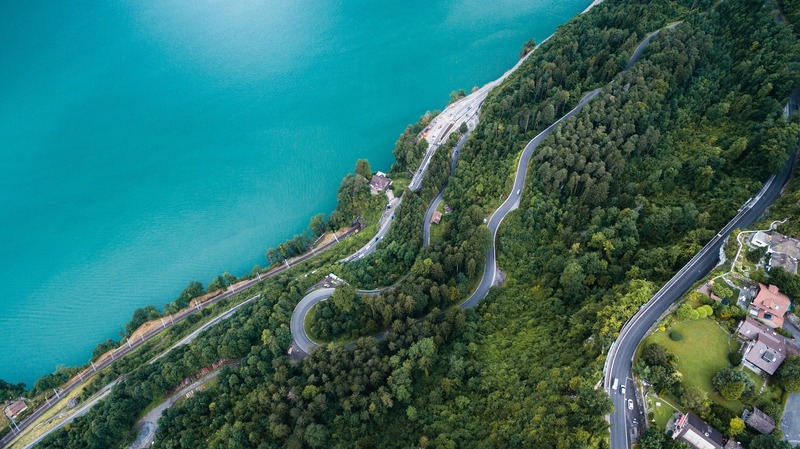 Not only are drones able to reproduce these shots more easily, but are also capable of producing shots that would be impossible with a crane. 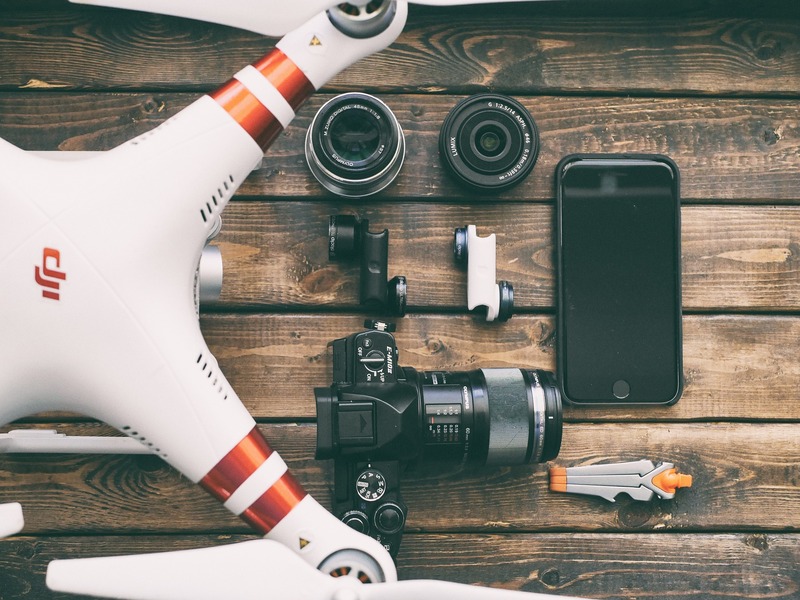 There is no doubt that drones are revolutionizing film and TV production. Currently, the filmmaking drone market is dominated by one company: DJI. DJI drones are the market leaders for a reason; their drones are simply phenomenal for filmmaking. And the Mavic 2 Pro is a perfect example. It’s a classic four prop drone but is designed to be foldable which makes it easily transportable. The control and handling are as great as you would expect from a DJI drone with its 3-axis gimbal technology, but the key when it comes to filmmaking is the camera. And the DJI Mavic 2 Pro doesn’t let you down in this respect. It gives the best images of any consumer level drone, thanks to its Hasselblad L1D-20c camera. The camera boasts a 1-inch CMOS sensor with a maximum ISO of 12800. This means the picture is still incredible even in low-light conditions. It uses what is known as Hasselblad Natural Colour Solution technology to provide incredible color detail at 20MP. The 10-bit Dlog-M color profile is capable of recording over one billion colors with an incredible dynamic range and supports 4K 10-bit HDR shooting. The lens aperture is adjustable from f/2.8 to f/11 so you can capture great footage whatever the conditions. There is also a built-in hyper-lapse mode for stunning full-motion timelapse shots. Best DJI Mavic Pro 2 Drone Deal! 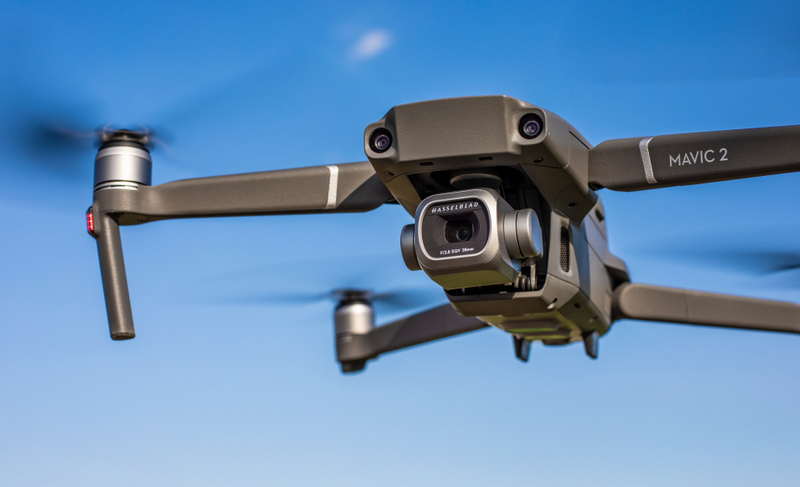 If you’re on a slightly tighter budget or need a wider range of shot options then the DJI Mavic 2 Zoom may be the choice for you. The Mavic 2 Zoom is another foldable four prop drone. The differences are in the camera. At the heart is a 1/2.3 inch 12 MP CMOS sensor, but the real power of the Mavic 2 Zoom is given away by its name. It sports a 2x optical zoom, which can give up to 4x zoom when shooting in Full HD. This has a number of benefits. The most obvious being that you can shoot at a safer distance from subjects such as buildings and vehicles whilst still getting great detail. It also allows you to make use of the telephoto lens for impressive parallax shots. This means that when shooting a moving shot focussed on a subject, the background will appear to move more quickly giving a more cinematic feel than for wide angle shots. There is also a very smart autofocus tracking system which ensures that your subjects stay in sharp focus even when you’re zooming in or out. There is even an in-built dolly zoom mode for recreating those classic Hitchcock shots. Best DJI Mavic 2 Zoom Deal! The DJI Inspire 2 is probably the number one drone for filmmaking on the market right now. If you’re looking for the best of the best, this is it! First off, you don’t have to worry about damaging your investment. The DJI Inspire 2 is packed with tech to keep it safe. A forward-facing FPV camera and obstacle-avoidance system are mounted on the front of the body, whilst IR sensors scan for obstacles directly above, with terrain sensors keeping an eye on the ground below. It makes the Inspire 2 ideal for shooting indoors or out, even in cramped conditions. The Inspire can be fitted with a choice of Zenmuse cameras, but we’ll take a look at the very top of the range: the Zenmuse X7. This camera boasts a super 35 sensor that shoots at 24MP. It is capable of an incredible 14 stops of dynamic range and can shoot in 6K CinemaDNG and 5.2K AppleProRes. The camera comes with 16mm, 24mm, 35mm, and 50mm prime lenses, all at f/2.8 with aspherical glass. The built-in spotlight pro feature locks on to a subject during flight so that you can film incredible tracking shots even without a second person manning the camera. This is a pro-level piece of kit and you won’t find anything better for drone filmmaking out there. Best DJI Inspire 2 Deal! 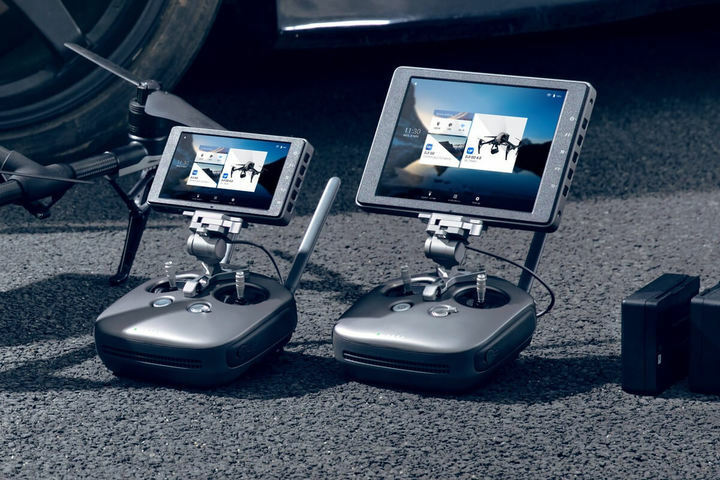 When it comes to accessories, the DJI CrystalSky can make a huge difference to your filmmaking. It’s an ultrabright monitor that is four times brighter than mobile devices. It means that you can get a crystal clear image of what you’re filming, even in bright sunlight. The optimized video decoding ensures that you get jitter-free real-time monitoring with no painful lag. If you’re shooting outdoors then the DJI CrystalSky is a must-have. ND filters are found in every good photographer’s bag and are vital when it comes to drone filmmaking. Neutral density filters are dark filters that reduce the amount of light entering the lens. The key to cinematic looking footage is to have some motion blur. That means shooting at slower shutter speeds. A slower shutter speed means more light entering the camera and on bright days this can lead to overexposed footage. By using an ND filter, the amount of light entering the camera is reduced allowing slower shutter speeds and producing beautiful cinematic looking footage. ND filters come in a range of strengths, and a full set is recommended to cover any situation from sunrise to bright snowscapes. Buy ND Filters for all DJI Drones here! Are You Ready to Start Filmmaking? Once you’ve made your decision on which DJI drone to go for, you’re ready to start your filmmaking adventure. But there is still plenty more to learn! We have a ton of great content on the site to help you with your next steps. Check out our in-depth drone guides and tutorials, including our drone film school for more great tips and advice. 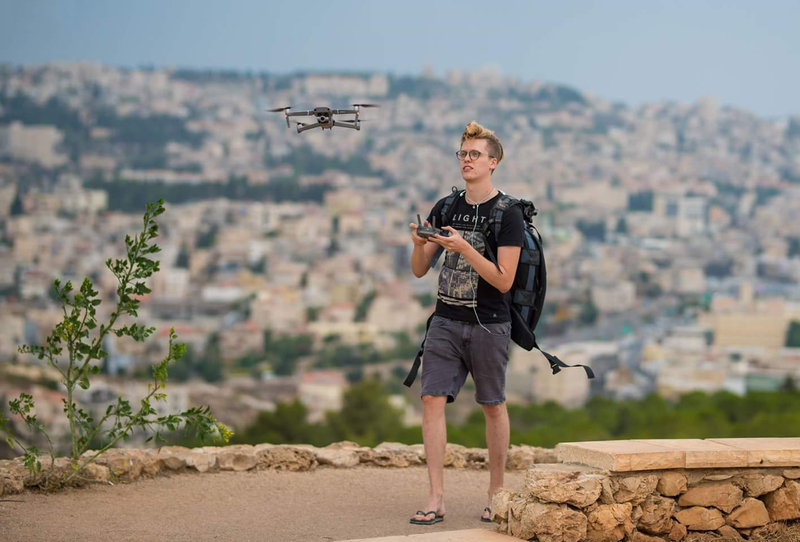 We wish you the best of luck with your drone filmmaking endeavors!